And while many recall its iconic red mixer, KitchenAid also boasts a line of smaller kitchen appliances that retained its signature attention to details, craftsmanship and quality. The KitchenAid Toaster Ovens are no exception. This group of products contains several unique features that you can choose from to meet your different household needs. In 1919, KitchenAid released their first household mixer and received worldwide fame. Fast forward almost a century later, KitchenAid has transformed the face of kitchen appliances to incorporate innovative technology while keeping their prices competitive. One of the highest reviewed products in its category, this oven scored with customers although it does not come with a digital panel as per most KitchenAid countertop ovens. 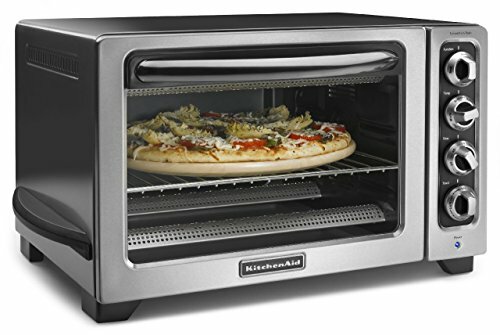 It has a decent capacity that allows you to bake 2-12” pizzas or broiler chickens. if you are looking for a simple, do-its-job kind of toaster oven, this product is a good choice. It does a satisfactory job of baking and broiling with not much counter space required. The heating up also requires little time and is ideal for making pizzas. Not only does it look good on a countertop, it also distributes the heat evenly while cooking. An oven incorporating more advanced technology, this KitchenAid countertop oven saves more energy and works as good as your regular sized oven. And of course, it makes great toast on top of great professional performance. This product also comes with a digital display. This KitchenAid Digital Convection Oven is a value for money purchase. You are looking at being able to make anything from toast, to broiled lamb chops, casseroles and pretty much any other baked goods that can fit into the oven. Most reviews have commented on the quality handle which is well insulated, and how the oven at full capacity is more than enough for most households. Like the KitchenAid Toaster Oven KCO222OB, this product comes in a liquid graphite colour and includes some accessories such as two stainless steel racks, a broil pan and crumb tray. Unlike the other ovens, this oven does not come with convectional properties. This product came after the KitchenAid Toaster Oven KCO222OB, so if you do have that model at home it works similarly. If you don’t fancy convectional baking then get this model. It is much easier on your wallet compared to the other available countertop models and does pretty much the same thing. This is perfect for you if you are staying alone, is a student or need this to serve a small household. Only available in Contour Silver, this product does not have a display panel but the knob features at the right hand side is more than enough to make most recipes. This product is considered very affordable for the amount of features it offers, including being able to produce quality food with lesser time. This product comes with two oven racks that can be used in four different support positions/distances from the heating element with the tray’s width enough to meet most household baking needs. This oven is slightly bigger than the other KitchenAid countertop ovens and needs slightly more space (measuring 20 inches wide). This KitchenAid digital convection oven model comes with an CeramaShield Coating that is both PTFE and PFOA free. In short it means that it is free of these two chemicals that are said to be harmful to the human body. It does come with a bigger price tag when it is coated with the CeramaShield. It seems that everything done healthier is slightly more expensive these days. But this model is definitely worth it with the coating and the number of colours available. Most users have commented how they can choose the colours that matched their décor. Overall a quality oven that packs excellent performance and a good purchase if you are willing to part with a little more cash. Most toaster ovens now come with convection properties and this caters for even heating and also produces quality baked goods. And it is good to note that all KitchenAid appliances come with a 1-year hassle free warranty and the models reviewed in this article all have a 12inch capacity. After reading this KitchenAid toaster oven review, you can consider using the process of elimination to decide which model suits you the best. Simply go through the checklist of criteria given earlier. If you are looking for a product that is straightforward, take the KCO222QG. And like some of us looking to move forward with a model that is more technically equipped and advanced, you can consider the models with display capabilities. This concludes the KitchenAid toaster oven review for some of the best-rated KitchenAid countertop ovens available. And since the KitchenAid brand is well known and established for its quality, craftsmanship and design, you can be confident that you are making a value purchase no matter which model you end up with.